Since October 2012, and in close cooperation, the Institute for Peace and Security Studies (IPSS) at Addis Ababa University (Ethiopia) and the University of Leipzig offer a three-year interdisciplinary doctoral training programme in the field of Global and Area Studies with a special emphasis on peace and security in Africa. The programme trains junior researchers and professionals in globalisation as well as peace and security research. It qualifies them for employment, among others, in international organizations, in the field of conflict management, prevention and resolution and early warning (as well as other areas of the emerging African peace and security architecture), and as future lecturers, scholars and researchers for the rapidly expanding higher education sector in Ethiopia and its neighbouring countries. 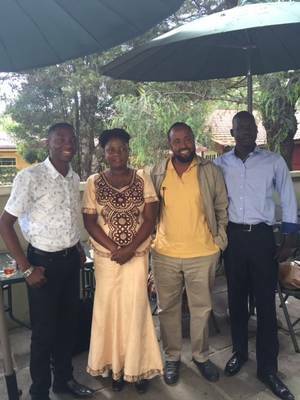 On the 27th of June 2016, the first joint PhD dissertation defenses of the "Global and Area Studies with a special Emphasis on Peace and Security in Africa" programme took place at the Centre for Area Studies. Four Ph.D. students from Addis Ababa presented and defended their dissertations successfully. Following the successful public dissertation defense, the students were awarded with the academic title of “Doctor of Philosophiae (Dr. Phil. )” in the field of Global Studies. The representatives of the PhD programme congratulate; Mercy Fekadu Mulugeta, Solomon Hassen, Fana Gebresenbet Erda and Dawit Yohannes Wondemagegnehu and wish them best of luck in their future academic endeavors. 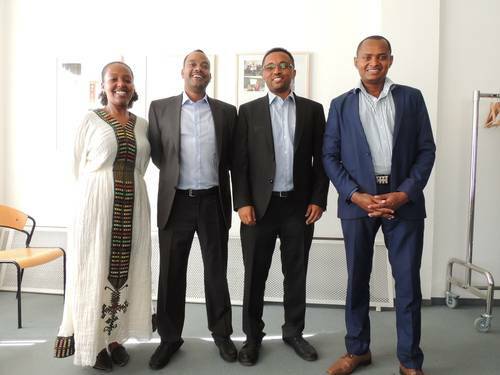 We are happy to present the new candidates admitted in fall 2015 to the PhD programme Global and Area Studies with a special emphasis on Peace and Security in Africa jointly offered by Addis Ababa University and the University of Leipzig. Out of 45 applications the professors from Addis and Leipzig chose their project proposals as they hold great potential for new insights and local knowledge production. Their diverse professional and academic backgrounds enrich the research community at the Graduate School Global and Area Studies. Luke Kue Yiech born in the district Makuey in Gambella, Ethiopia holds a Bachelor degree in accounting which he acquired from the Ethiopian Civil Service College in 2004. He worked several years at the Gambella State Authority before he joined the Azusa Pacific University which offers courses at the International Leadership Institute in Addis Ababa and graduated in 2010 with an M.A in Organizational Leadership. From 2010 to 2015 he worked as Administration and Finance Assistant for the International Organization for Migration (IOM) in Gambella and Dolo Ado Sub Office in Somali. His dissertation topic focuses on the Nuer and their traditional mode of governance and interaction with the state system. In particular he will look at clan politics in the Nuer Zone in the Gambella Regional State. Abdisalam Mohamoud Ahmed holds a Bachelor degree Arabic Studies and a Master’s degree in international conflict management from the University of Nairobi’s Institute of Diplomacy and International Studies (IDIS). He worked as mediator, traditional leader and local peace maker with particular knowledge in local history in the new Somalia. With this background he embarks on a comparative study of traditional leaders in conflict management in Ethiopia and Somalia. Precious Nzala Timba Chilufya is a Zambian academician who has taught in several secondary schools and lectured at Mulungushi University, one of Zambia’s public universities. At Mulungushi she coordinated the Bachelor of International Relations programme. She holds a BA in Public Administration from University of Zambia-Lusaka, a BSc. in Political Science from University of Zimbabwe-Harare where she also obtained her MSc. in International Relations. Precious’ PhD thesis is entitled “The Concept of State Failure in Africa: Lessons for Peace and Security from Zimbabwe’s unfailing since 2002”. Tony Ssembatya Kimbowa is born in Uganda and holds a BA in Philosophy and Social Sciences from Makerere University-Kampala, an MA in Conflict Management from the Alice Salomon Hochschule-Berlin and certificates in Natural Resource Management from the Geneva School of Diplomacy. Until recently he interned and consulted for UN Women-New York. He is writing his PhD dissertation on Stateless Women and Girls, taking a case study of Uganda.